Marco Cecchinato celebrates his victory over David Goffin at the French Open. 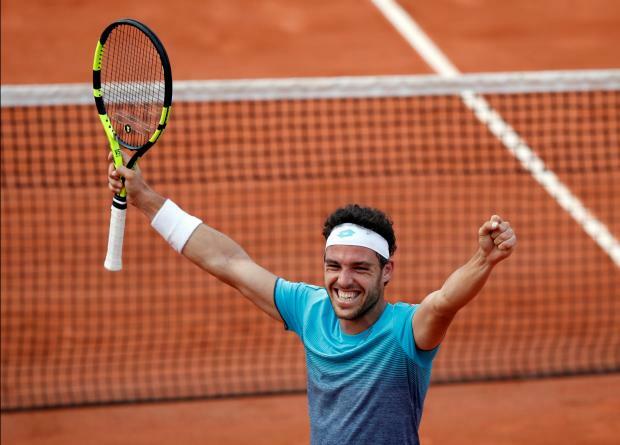 Unheralded Italian Marco Cecchinato stormed into the French Open quarter-finals by upsetting Belgian eighth seed David Goffin 7-5 4-6 6-0 6-3 on Sunday. World number 72 Cecchinato, who had never been past the first round at a Grand Slam, will next take on 2016 champion Novak Djokovic of Serbia. "For me it's a dream, I'm really really happy," Cecchinato, who rallied from two sets down in the first round, said on court. "And now I'm playing the quarter-finals, it's unbelievable. "Forza Italia!," he added as he addressed a small contingent of Italian fans on court Suzanne Lenglen. The 25-year-old Cecchinato could be joined in the last eight by compatriot Fabio Fognini, who plays third-seeded Croatian Marin Cilic on Monday. Should Fognini win, it would be only the second time since tennis turned professional in 1968 that Italy has had more than one player in the men's singles quarter-finals at a Grand Slam. The only other occasion was at Roland Garros in 1973, when Paolo Bertolucci and Adriano Panatta reached the last eight. Fognini was the last Italian man to make the quarter-finals in Paris in 2011. Cecchinato found some gravity-defying angles to outmanoeuvre Goffin in the first set. The Belgian faced more break points in the fourth game of the second set but managed to see them off and after receiving treatment on a sore elbow, he broke for 4-3 before levelling the match. Sicilian Cecchinato, however, was on fire in the third, which he pocketed when Goffin buried a routine smash into the net. After an early trade of breaks in the fourth, Cecchinato broke Goffin's serve with a fine backhand winner down the line to move 5-3 up. Cecchinato kept his cool and won the next game to love, ending the contest with a superb single-handed backhand winner down the line.